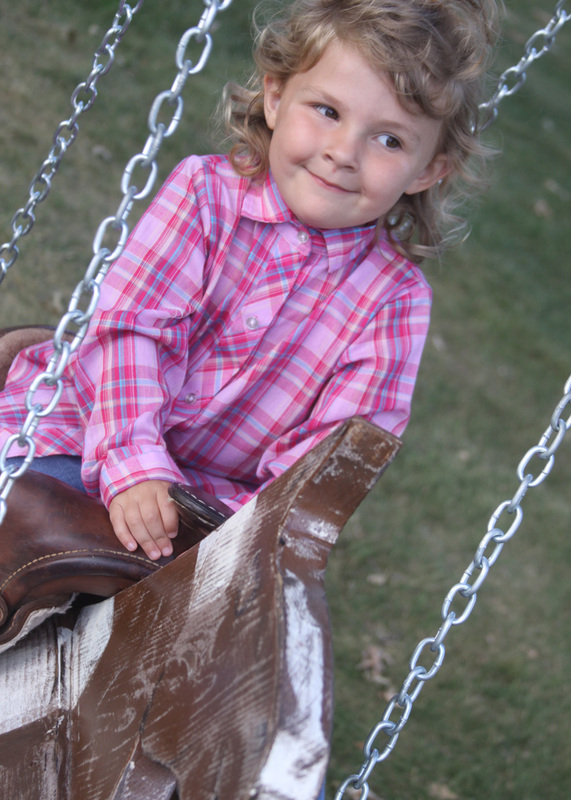 An idea to hang a horse saddle in a tree as a swing turned into a family affair. A little help from each member in the family has resulted in a saddle swing complete with a horse painted like our favorite spotted pony. We now have a swing that is fun for kids and adults alike. You seriously can’t help but smile while riding on it! Today I am sharing a project with you that has been about six months in the making. Let me tell you, it has been well worth the wait! It started with a crazy idea, turned to a family project and is know a favorite backyard decoration, and more importantly everyone’s favorite pastime on a summer night! This idea was inspired by an image that I saw on Pinterest. As soon as I spotted a beautiful saddle hung in a tree as a swing and could not get the idea out of my head. I showed it to my Mom sometime around my birthday back and April and we made it a our mission to hunt down a saddle that we could make into a swing. 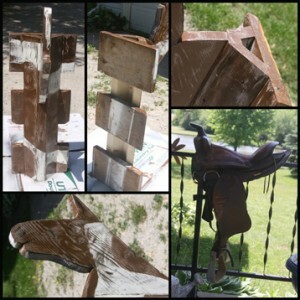 I wanted a weathered old saddle with lots of character. We looked on Craigslist and at local horse related shops for a saddle that would fit the bill with little luck for months. I was totally not wiling to spend the 100 or more dollars that people were asking for old beat up saddles (I totally understand why they were asking that much – but my project was not worth that cost). My mom and I go to the Midwest Horse Fair each and every year together and we had high hopes that we could find something there that would work. We stopped at a little tack shop and a woman was selling a beat up old leather saddle that her family was no longer using. It was the perfect sized saddle, had some great details, and was heavy and made with real leather. She was asking $45 dollars for the well loved saddle, and had tears in her eyes as she sold it to us because she had taught all of her own children to ride in it. I told her that although the saddle would not be going on a horse again, that it was going to be well loved, and boy was I right. My Mom surprised me and said that she would get me the saddle for me for my upcoming birthday and I was super excited to finally have the perfect saddle for my swing project. I had been talking with my Dad about how I was going to turn the saddle into a sturdy and safe swing for kids and adults but was undecided on a plan. A couple weeks passed and my birthday rolled around. My parents brought the saddle over all wrapped for me as a gift. I opened the saddle and then realized that my Dad had another surprise for me. I opened a large package that had an unpainted wooden saddle rack shaped seat with a horse head attached that he had hand crafted in his wood shop for the saddle to sit on. 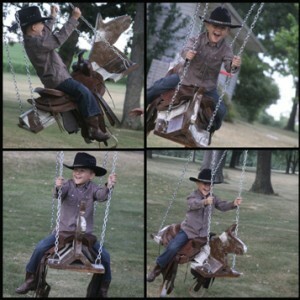 I had no idea that he had planned out away to make the saddle into a swing and went ahead and made it for me. He is quite the skilled carpenter, and it was no surprise that he would be able to come up with the perfect solution to hanging my strange request for a saddle swing. 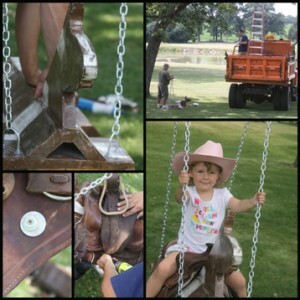 The making of this saddle swing really became a family affair. 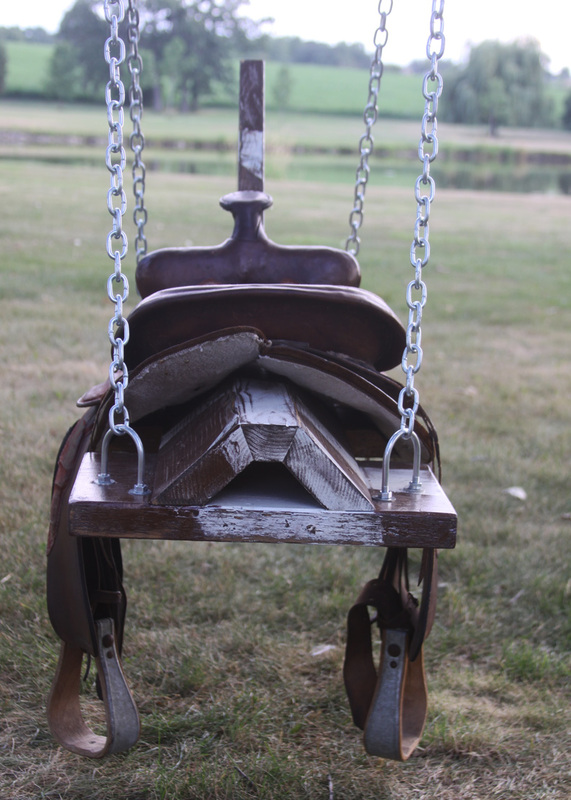 My Mom, Dad, Husband, and I all worked together to make this saddle into a swing, and it turned out even better than I could have imagined. 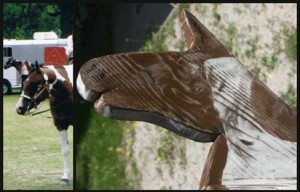 The horse is shaped so that the saddle can sit securely on it without tipping from side to side. Basically he made a saddle rack (just like you would find in a barn to store saddles on) and attached a horse head to the top of it. He hand drew the horse head and cut it out with a jigsaw. He also attached three pieces of wood to the bottom of it for stability, and to attach the actual hardware to hang the horse with. He measured the saddle to make sure the horses back was long enough to fit the saddle and gave ample room for a person to sit on it in between the chains that it would hang from. My next job was to paint the horse before we could attach the saddle to it. Of course I chose to paint it like my “Spotted Pony” Toby! I started with a few layers of black paint as a base. I added a layer of white paint and then a top coat of brown. I then got to work transforming the wooden horse into my dear Toby using white and black acrylic craft paints. I mimicked my horses actual markings on the horse and gave him eyes and other features. I really wanted the swing to look natural and weathered so I did a fair amount of distressing on the paint job. It really softened the paint job and made it a little more rustic. A added about 3 layers of an outdoor lacquer spray to seal the wooden horse so that could survive outside. My Dad included all of the hardware to hand the swing in my birthday gift, and he had a plan of attack on how to hang it. 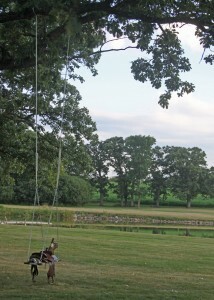 We have a huge old oak tree in front of our house that was the perfect spot for the saddle swing. We attached four U shaped brackets to the front and back pieces of wood on the bottom of the saddle rack. We had decided that hanging it from each side (instead of front to back) would be the most stable. We My Dad and the hubby then attached chains on each side of the horse and added round grommets to attach the rope to. The grommets can be opened so the horse can be taken down and stored over the winter or in bad weather. To the grommets they attached rope that they had hung from the tree. 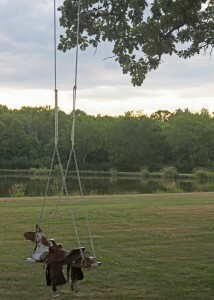 The hanging of the horse swing was no easy task, and I was very grateful to have the hubby and my Dad engineering the best possible way to hang the swing. After the horse was hung in the tree it was time to add the finishing touch – the saddle. We put the adult sized saddle into position and moved the stirrups to a point where they would be just above the ground when an adult was sitting on it. The hubby then lifted the stirrup and drilled a screw right the the saddle’s tree into the center piece of wood under the saddle rack. 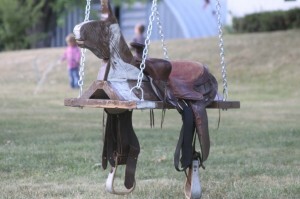 The saddle was secured on both sides, and the saddle swing was complete. All it needed was a little cowgirl to test it out! 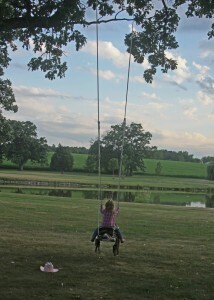 The saddle swing is made for adults and children, and has been a total hit all summer! 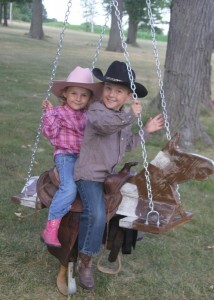 The saddle makes it super comfy to ride on and I love that the kids can hang onto the horn while they are swinging on their Toby swing. Every single person that has ridden on the swing has this priceless smile on their face after their first ride and every ride thereafter! It is unbelievably fun and I can’t get enough of the smiles that it draws out of everyone! The kids can’t quite reach the stirrups yet, but adults can sit in the saddle with their feet tucked right into the stirrups. This swing is a great cure for a long day and is usually in full swing as the sun goes down on summer nights. I not only love the joy that it brings to everyone that tries it, but I love how it looks hanging from the big oak tree outside. It is simple, and the perfect combination of old worn leather, and distressed paint for me. There is really nothing sweeter than seeing my little buckaroos swinging happily on a beautiful day on a horse swing that was made with love with help from the entire family! I found a great waterproof saddle cover for under $10.oo at a local tack shop to help protect the saddle from sun, rain, and birds. It sits right over the saddle and had elastic to keep the cover in place. 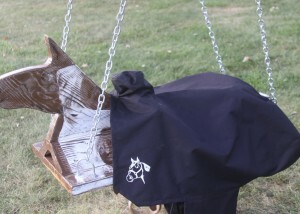 It is a great way to protect the leather saddle from the elements so that I can keep it up all summer long. Our saddle swing is always ready to ride, and it has quickly become everyone’s favorite place to relax outside this summer. This is absolutely wonderful.i love it and I love the love that went into it.. I love the saddle swing and am trying to make one now. Do you happen to have dimensions for the supports underneath the saddle? I cannot determine whether the center one is narrower than the front and back pieces. Also, how far apart are the U shaped brackets at each corner? Thanks! Love your DIY pages. I got an old saddle today. Wish me luck on getting this hung. My hubby isn’t as enthused about this idea as I am. Thanks for sharing the method you used. It looks really safe and stable. I love the swing. As a child I wanted a horse an we could not afford one. Although we had plenty of land, it had to be used for crops to pay the paymens and taxes. This would have been the answer. As it was, I used to climb up into the trees and pretend one of the limbs was my horse. I am now 68 years old. My daughter lives on part of the home place and one of my favorite horses (trees) is still standing. I am hoping she can get her husband to build a swin for that tree. Thanks you have made my day. Cant one pick up a comfortable used saddle for a lot less than 499 dollars? Love it!!! I have an old saddle and now I know what it’s final purpose will be!! Thank you! I think i’ll even use rope to hang it. LOVE this! My parents have my old saddles and such from when I was a kid, right now its hanging on their loft railing in their log cabin. But this is a fantastic way for my kids to keep using my riding equipment even with the farm and horses gone! Any chance we can get a step-by-step “how to” on this? I’d love to make one for my dad. use the measurements and size of the wood, whether 2×6,2×8 and 2×12 ? I have everything laid out and started to cut but I am confused and have been trying to guess the measurements and how you attached the wood. Now I know exactly what to do with my old leather saddle!!! Really love this and dimensions of the support wood underneath would be wonderful! I saw that original pin and fell in love with it too! I’m so happy that you made it and everyone is enjoying it so much…too bad I live in the city with not a tree in sight or I’d have one too! We have a granddaughter who loves to ride horses. Her mommy has old saddles and we are looking forward to making this swing for her. Would love to have the measurements for the project! Thanks for this great idea! So cute! I want to make this for my Father-in-law to have a his ranch for the grandkids 🙂 Do you have the measurements of the wood? I think I can figure out the step by steps but am stumped on the measurements… Thanks!